Find your ideal half-apron here! Skirted aprons are ideal for people who are bothered by the strap around the neck of a standard bib apron. They're easy to wear and can be extremely stylish, perhaps even doubling as an actual skirt in a pinch! Here are five styles to explore. What's black and white and red all over? 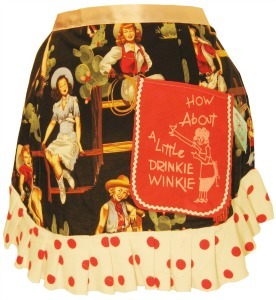 The answer to the age-old riddle is this adorable half apron from Carolyn West. The red cotton fabric of the thick waist band and ruffled hem is speckled with white dots, and the heart-shaped pocket with lace trim is a lovely feminine touch. As expected, Etsy has quite a collection of skirted aprons. This Cute as a Button Reversible Half Apron by LibbyandLee is just as lovely one way as it is reversed. One side features the buttons, which are a nice touch and obviously made it an easy apron to name! When reversed, a leaf print with brown, red and navy is exposed. The crafter is willing to specialize orders — all you have to do is ask! Retro Eclectro (what a terrific name!) has several interesting skirted aprons, including this one entitled Meme From the Hip Black. The trim is ruffled and the fabric is extremely retro. The logo on the pocket is something the buyer can choose — options range from silly to scandalous, but each is fun and funny! Another find from Etsy is this very stylish half apron by 4RetroSisters. Everything from the style to the fabric screams timeless classic. In fact, it almost seems sophisticated enough to wear out for a night on the town. The details are definitely worth noting — there are pom poms along the turquoise hem and a fabric flower adorns the waist band. Bringing up the rear is this particularly interesting skirt apron by Warning which combines gothic and girly notions to produce a one-of-a-kind creation. 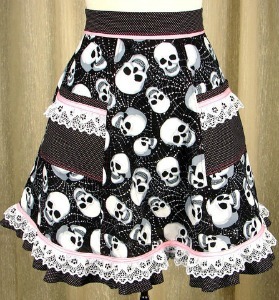 As vintage aprons go, you'll be hard-pressed to find another one featuring both skulls and lace! 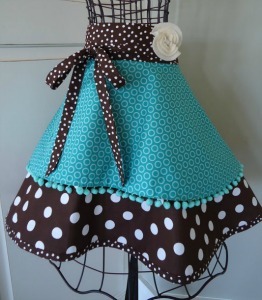 Skirted aprons fit snugly and are just as individualized and lovely as standard bib aprons. As you can tell, the options available run the gamut from frilly to fierce!